ISLAMABAD: Federal Minister for Planning, Development and Reforms Khusro Bakhtiar on Thursday said that the government expects the private sector corporations to step up and partner with the government in redefining Pakistan’s future. 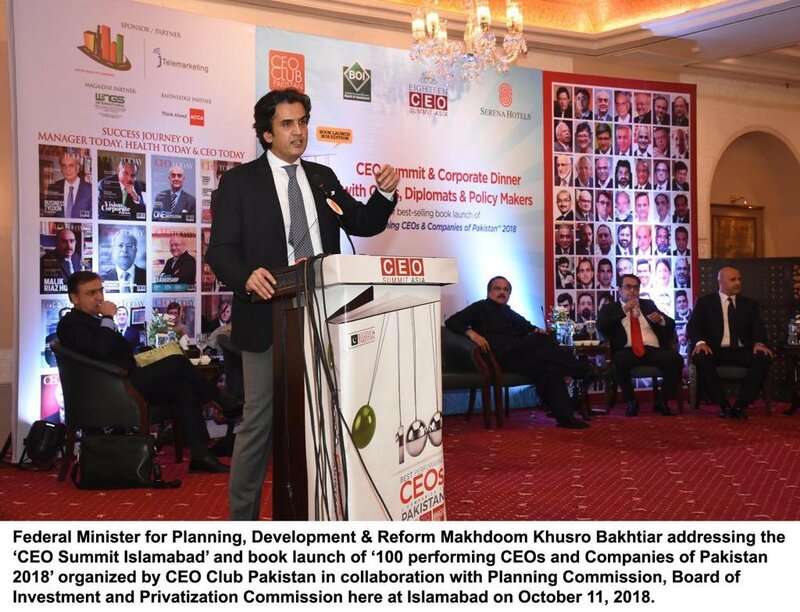 Addressing the ‘CEO Summit Islamabad’ and book launch of ‘100 performing CEOs and Companies of Pakistan 2018’ organized by CEO Club Pakistan in collaboration with Planning Commission, Board of Investment and Privatization Commission in Islamabad, the minister stated that the government’s primary role is to act as facilitator for sustainable and responsible business to flourish and it expects the private sector corporations to step up and partner with the government. The minister maintained that the private sector’s potential to contribute to the treasury’s domestic revenues is critical for meeting the government’s developmental goals by financing essential public goods and services. He noted that major roadblocks to growth have been the historically low private investment, little or no investment by business in R&D and domestic operations. “Pakistani businesses need to step out of their comfort zones and invest in acquiring latest technology, business practices to become competitive at regional and international level and employing our growing youth bulge in value added industries of the future especially science and technology,” said Bakhtiar. He stated that sustainable development is best served where private sector positions itself to foster inclusive growth noting that our talented private sector has the potential to lift people out of poverty. He further said that evidence suggests that over 80% of jobs in developing countries are created by the private sector however unfortunately only ¼ of the working-age population is engaged in productive employment. The minister stated that more than 80% of the workforce in Pakistan remains employed in informal sector jobs which need to be changed. “Now is the time that we work together to change the destiny of our country. A progressive and affluent society devoid of social disparity and injustice will strengthen Pakistan and contribute to the growth and future of businesses,” stressed the minister. Talking about CPEC, the Minister stated that the Corridor is graduating from start-up phase to a more mature period in its development. He underlined that the scope and base of CPEC is broadening and deepening adding that the mega project has the potential to spur GDP growth and transform Pakistan into a regional economic hub. Bakhtiar stressed upon the industrialists to bridge the industrial divide between Pakistan and China by initiating joint ventures in various sectors including manufacturing, services, construction, agriculture and energy. The minister concluded by congratulating the best performing CEOs and companies on their achievements and hoped that they would continue to contribute to country’s socio-economic development for a prosperous Pakistan.